How many slaves work for you? If you’ve answered “zero,” you’re probably way off. 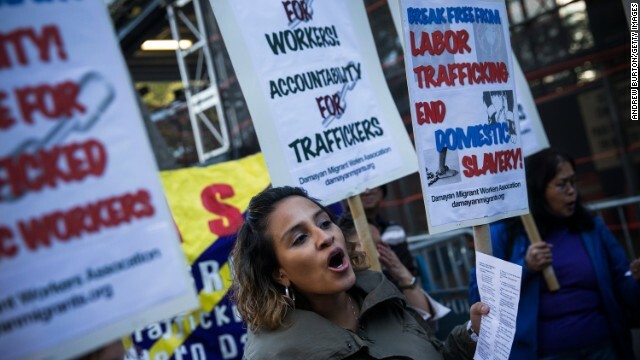 At least that’s the premise behind Slavery Footprint, an online survey developed by the U.S. State Department and anti-slavery organization Made in a Free World. The web interactive invites users to insert information about their consumer habits and lifestyle choices - this covers everything from what sports you play to what products line your medicine cabinet - and then determines approximately how many forced laborers they rely on. The results are startling. It turns out that if you’ve ever eaten, worn, or used pretty much anything, you’ve likely been complicit in some form of slavery. In fact, Made in a Free World estimates that there are some 29 million slaves in the world today. But the project’s goal is education, not blame. After completing the survey, you’re encouraged to be more thoughtful about where your products come from, and send pre-written emails to companies asking what they’re doing to address forced labor in their supply chains. Israel's policies are enslavement of Palestinian people. For everyone who takes the US and being a US citizen for granted need to wake the F up. For people who would defend countries like Russia (Snowden) or N. Korea (Rodman), need to wake the F up. Its ridiculous to me these people, you throw some loose change their way and their willing to defend these countries like there the answer to the worlds salvation. There is no such thing as a perfect world and anyone who thinks there is all delusional. Not because one mans sense of what a perfect world isn't attainable but because it's just that, one persons idea of it. One personal idea of a perfect world is probably completely different then another's. What do you think Kim Jung Un's perfect world is? One where people have freedoms? Liberties? Justice? If you answered it is, the. You must either be corrupt, bribed, on his payroll or just dumb. This is a good article and good thing for people to consider. There is still slavery and forced labor around the world. And US citizens in their sheltered existence must come to realize, just because people "appear" to be lookin out for you, it doesn't necessarily mean they are. People like Rodman made me sick. Going to N. Korea, and just because he got paid and given the red carpet treatment, he somehow believes Kim Jung Un is this super nice guy. Seriously? For people who would defend countries like Russia (Snowden) or N. Korea (Rodman), need to wake the F up. Its ridiculous to me these people, you throw some loose change their way and their willing to defend these countries like there the answer to the worlds salvation. There is no such thing as a http://www.clavierenarabe.org perfect world and anyone who thinks there is all delusional clavier arabe. One where people have freedoms? Liberties? Justice? If you answered it is, the. You must either be corrupt, bribed, on his payroll or just dumb. And if the terrorists are not stopped in their tracks. Most of the civilized world will end up as slaves to that abomination to humanity. Thats the final goal. Enslavement of all but a few in the religion. If the trail is actualy followed back to the beginning. At least 80% of slave labor can be traced to center in one area and is done by one particular so called religion. And the rest is either controled by it or encouraged by it.. No other religion has the instructions that I have ever heard of like one.. And it tries to completely negate any rules or laws thats not in place to force slavery out of existance. We must all learn this hard fact. Before its to late to stop it from spreading. If the majority ever knew the truth about sharia law. Which is so screwed up a woman and child dies at the hand of the wirthless husband because she had the NERVE to have a daughter in childbirth instead of the ORDER to have only boys.. But the facts of genitics are ignored with murders commited dozens of times per week. !